OK, by now you should be aware of the growing number of videos on Facebook and YouTube that feature a 360-degree take on the surroundings. You might have wondered how they managed to do that, you might even have wanted to do it yourself on your iPhone. Well, to be honest, it’s really no rocket science, and with a half-decent 360 camera for iPhone you could be pumping out your own 360 live streams and vlogs in no time. To save you the trouble of wading through the morass of manufacturers’ fluff and technical mumbo-jumbo, we did an exhaustive (and exhausting) research into 360 degree camera for iPhone, and made a short list with the very best of them, plus an added bonus at the end. 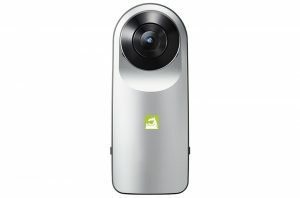 We’ll kick off this list with one of the best, if not the best 360 camera for iPhone (ironically, not from Apple) – the LG G5 Friends 360 CAM LG-R105. Don’t worry, it’s fully compatible with iOS, and can be used on its own (though not recommended). It’s got a pair of 13MP sensors looking in opposite directions, and both of them are equipped with a wide-angle lens (fish-eye). Obviously, the dual-lens design allows you to shoot in either 180 or 360, and you’ll need to get a smartphone app to be able to do either. On the flipside, the video you’ll get will have amazing res (2,560 x 1,280), and you’ll be able to upload it directly to YouTube360, just as you’ll be able to upload any photos you take to Google Street View as soon as you take them. The very aptly named Bublcam allows you to capture true spherical videos in HD (it’s not only 360, it’s 360 x 360, with four 5MP cameras in a spherical body). On that note, it also includes features for HDR (High Dynamic Range – makes you photos better in crappy lighting conditions) as well as time lapse photos. Yes, it’s compatible with iOS (ioS 8 and newer), but also Android (4.1 or newer), so there’s no need to worry. 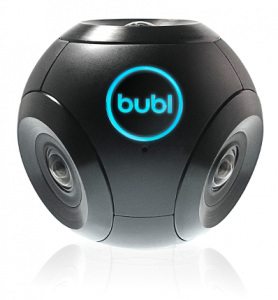 Moreover, the Bublcam is WiFi enabled, which should come in real handy when you get an itch to do a live stream. It’s really user-friendly, and plenty durable, but still a new kid on the block (and that’s talking about a really, really new block), so it’s tough to tell how it will perform in the long run. As is, the community seems to love it. The Ricoh Theta S Digital Camera is one of the most user-friendly 360 cameras out there. It pretty much does all the work of shooting, stitching and creating spherical photos, all by itself, and all you have to do is press a button. You can control it via WiFi at about 15 feet of distance, though you’ll need to download a special app (don’t you fret, the camera is fully compatible with iPhones and/or iPads). 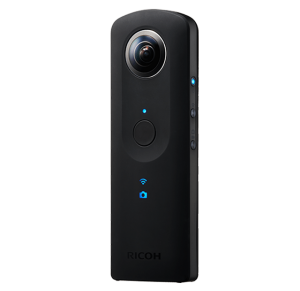 As far as the video and image quality goes, the Ricoh Theta S features two 12MP image sensors that work together to combine an output image with 14MP res (that’ll be 5,376 x 2,688), as well as up to 25 minutes of HQ 30 FPS videos. Though, to be technical, the video resolution is 1920 x 960, and the processing does take its toll. The manufacturer did release a video-editing app recently for Androids, cleverly namdd Theta+ Video, if that’s of any help. The 360fly 360° 4K Video Camera is advertised as “the world’s smartest 360-degree video camera”, and with good reason. It has more bells and whistles than a herd of Swiss cows, and it’s durable enough to survive that heard walking over it. It’s water-resistant, dust-resistant and shock-resistant (though not shatterproof), and will survive anything you throw at it. This makes it ideal for climbers, mountain bikers, skiers and other outdoorsy types that want to share their experiences with the rest of the Internet. Moreover, it’s got 64GB of its own memory (though no micro-USB), and its own tripod mount. Granted, it has some slight drawbacks, such as making vids really best viewed on smaller screens, where you won’t notice the purple fringing as much. The Nikon KeyMission is one of those rare products that live up to the reputation of the brand as a whole. First of all, it’s built to survive any punishment you can dish out – it’s waterproof, shockproof and will withstand freezing temperatures, which really recommends it to mountain-climbers, snowboarders, or anyone who enjoys outside sports (although, it’s not really an action cam, so keep that in mind). Moreover, it’s instantly compatible with Facebook and YouTube, so you can upload your vids and pics as you make them (yes, it’s fully compatible with any iOS, or Android, for that matter, via the companion app). It connects using either WiFi or Bluetooth, but keep in mind to find a high-capacity microSD card to use with this monster, since you essentially have two lenses filming in 4K, meaning that a minute or two of video can easily take up 1GB. If you don’t need a standalone 360 camera for your phone, you might want to check out some iPhone 360 Camera Accessories. Lucky for you, we have a list for that, as well. The Insta360 Nano is pretty much what it reads on the tin – a small, 360-degree camera capable of making high-res video footage with a crispy aftertaste. 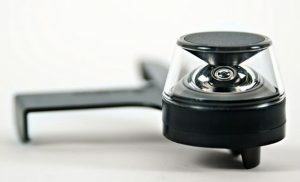 This amazing 360 camera adapter for iPhone connects to your iPhone’s lightning jack, allowing you to record videos by holding your phone upside down. The app you’ll need to use this comes with the purchase, and it’s free of charge. With this on your iPhone, you can make some HD res (3040 x 1520) 30FPS vids, and pump them out in real-time to your Facebook live stream. You’ll also be getting a VR cardboard box with your purchase, so that you can enjoy a bit of wholesome virtual reality immersion in 3K 3D (that’s not a typo). The Giroptic iO is one resistant piece of high tech, able to make true 360-degree images thanks to its three top-mounted lenses. It’s a bit oddly shaped (like a pear), but once you get past that, you see the real beauty of this little fellow. The sound is more than adequate, and the video even better – 2048 x 1040p, though it does have some issues stitching the images together, particularly at the point where all three of its optic sensors converge. Still, this is the closest thing you’ll come to capturing true spherical images at the moment. The iO is, as you might’ve guessed from the name, compatible with iPhones, as well as iPads, but not Androids (though the manufacturer is considering branching out). 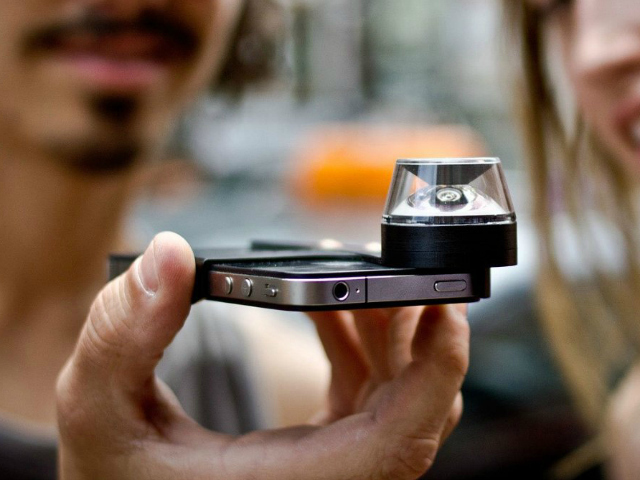 The Kogeto Dot is a nice, user-friendly lens that you can snap onto your camera and use it to make 360-degree videos, as well as photos. In essence, it pretty much makes any camera besides that on your iPhone utterly redundant. Granted, there’s a catch – the Kogeto Dot is only compatible with the iPhone 5, 5s, 4 and 4s. On the flipside, it gives the owners of older models something to be happy about. It comes with a companion app (“looker app”) that essentially takes your camera’s raw view image and turns it into a panorama that you can navigate without having to rotate your phone. On a balance, it seems unfair to pick the best 360 camera for iPhone from what’s on the list, but some recommendations do seem to be in order. So, if you want a good budget-friendly option, without sacrificing the quality, check out the LG. 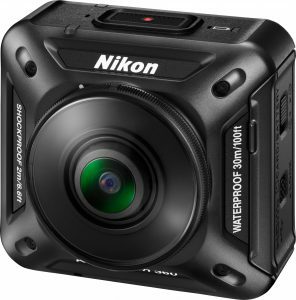 For a best-bang-for-the-buck type of deal, you can’t go wrong with either the Ricoh Theta S or the Samsung (though…), whereas if you really want to get the best quality, and in a virtually indestructible package, you might want to check out the 360fly, with the Nikon KeyMission 360 coming in as a close second.